Ascension is working under a thinner operating margin as it weathers the ongoing challenge of slumping admissions. The St. Louis-based system reported its operating margin fell by more than half in the six months ending 2017 to 1.4%, compared with 3.8% in 2016. Ascension, which is on a June 30 fiscal year-end, reported that operating revenue during that time was $11.3 billion, down slightly from $11.4 billion in the same period in 2016. Of that, however, only $84.7 million was income from operations in 2017, compared with $379.6 million in 2016. Expenses were up, too, especially in purchased services, provider taxes and supplies. Total operating expenses before impairment, restructuring and other losses was $11.2 billion in the latter half of 2017, up from $11 billion in 2016. In a report summarizing its financial results, Ascension wrote that its drop in operating revenue was primarily due to the divestitures of two hospitals in Wisconsin: Saint Joseph Hospital in Marshfield at the end of June and Door County Hospital at the end of October. At the same time, however, operating revenue on a same facility basis was up $91.1 million during the last six months of 2017, which Ascension said was because the system has managed to get 2.8% more revenue per discharge, thanks to targeted efforts to improve its revenue cycle operations. Ascension isn't the only health system that has managed to squeeze more revenue from individual patient encounters. Catholic Health Initiatives announced earlier this month it had increased its net revenue per admission by nearly 4% in the same quarter, while HCA reported a 3.5% increase in revenue per admission in its latest release. 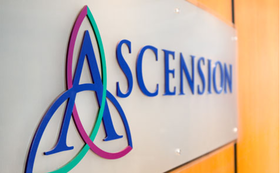 Like many health systems, Ascension is struggling with slumping volumes. Total admissions and emergency room visits were each down 4% in the last six months of 2017, and discharges were down about 3.3%. But strong investment returns continue to provide a boost. Net income was 8.2% in the six months ended Dec. 31, 2017 compared with 6.7% during the same time in 2016, which Ascension said was primarily due to its investment portfolio. In the most recently ended quarter—the second of Ascension's fiscal 2018—the system's total operating revenue remained roughly $5.8 billion. Its operating expenses increased slightly to $5.7 billion from $5.5 billion in 2016. Excess of revenues over expenses attributable to controlling interest was $528 million compared with $287 million in 2016. Ascension is also seeing more patients that qualify for charity care. The system's charity care costs increased by $21 million, or 8.6%, during the last six months of 2017. Ascension spokesman Nick Ragone wrote in a statement that the system continues to implement a cost restructuring and sustainability plan that began last year, including creating a broader ambulatory footprint to meet changing demand. "While we continue to see the benefits of our operational improvement initiatives and standardization across our system, like other systems, we were negatively impacted by rising costs, increased uncompensated care, and Medicaid reimbursement program changes," he said.